1 gate – A front surf wave for freestyle newcomers. At some hard to predict levels, normally just before the weir closes completely, this wave becomes retentive for spinning and elevated moves. 2 gates – A nice clean wave next to the wall, flanked to one side by a nice hole. 3 gates – A big wave with curling shoulders both sides, flanked by two great holes. At this level Hurley is pretty close to unbeatable. 4 gates – A series of linked holes. 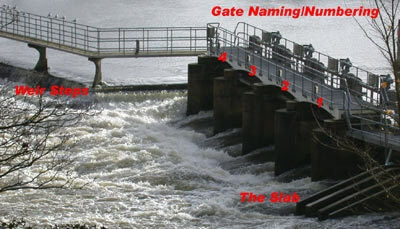 The hole in gate 1 stays pretty much the same as if the weir were on 2 or 3 gates. High 4 gates – The holes furthest away from the eddy get progressively chunkier, but still safe. Extreme flood (really extreme) – the gates start to wash out. Hazards: You need to be aware that the pourover steps on river right are undercut, so be careful when nearby (especially when swimming). Directions: Click this link Hurley Village Carpark or follow these directions from the A404M between Maidenhead and High Wycombe take the A4010 to Henley. At the big roundabout follow the signs to Henley. Drive up a big hill (noting the Red Lion pub at the top of the hill), down the other side, then take a right signposted Hurley village. Drive sensibly through the village all the way to the end of the road and then left into the car park. Get changed quietly and discreetly. Try not to take anything valuable to the weir in the first place, but if you do, make sure to hide it well or take it with you on the water – thieves are a problem in the car park. There is a footpath to the waterside that follows on from the direction the road was heading before it came to an end. Walk down the path to the waterside, and paddle upstream to the left. After 20 yards you will see a medium sized weir with 4 proper big gates down to the right. This is the Buck Weir. Keep going upstream for a couple of hundred metres, passing a funny little weir that has planks of wood for gates, and you will arrive at the main weir.